Was King Tut the Pharaoh of the Exodus? The historical understanding of Israel as a nation and its identity as a people chosen and set apart by God is based on the events that occurred at the time of its Exodus from Egypt and the covenant God established with the people at Sinai. Israel’s national theology was developed out of their experience with God in Egypt and in the wilderness. Although the Exodus from Egypt is the crucial event that gives meaning to the history of Israel, the only account of the mighty acts of God in delivering Israel from their oppression in Egypt is found in the book of Exodus. Outside the Bible, there is no specific reference to the Exodus in any other historical record. The Bible says that the people of Israel were slaves in the land of Egypt. During the many years the Hebrews were in Egypt, they built cities for Pharaoh. Unfortunately, the Bible does not mention the names of the Pharaoh who oppressed the Israelites nor does the Bible give the name of the Pharaoh who ruled Egypt at the times the people of Israel left. Since the writer of the book of Exodus does not provide the name of the Pharaoh ruling Egypt at the time Israel departed, one must use indirect information and speculate on who the Pharaoh of the Exodus was. Stephen Rosenberg, a Senior Fellow at the W. F. Albright Institute of Archaeological Research, Jerusalem. In an article titled, “The Exodus: Does archaeology have a say?” published in the Jerusalem Post, Rosenberg proposes that Tutankhamun, also known as King Tut, was the Pharaoh of the Exodus. Below are a few excerpts from Rosenberg’s article. Thanks to slave labor, Akhenaten’s model city was built in record time, but it did not last long. After only 16 years, Akhenaten died, his reforms had been deeply unpopular and when he died, his new religion was abandoned, and so was his city. Akhenaten and his beautiful wife Nefertiti had had no son, only six daughters, and so it was one of the sons-inlaw who succeeded him: Tutankhamun, the famous boy king Tut. Hapi, the androgynous god of the Nile, would make its waters undrinkable; Kermit, the goddess of fertility, would release her frogspawn to swarm over the land; Osiris, the god of corn, would not prevent the locusts from consuming his cereals, and Ra, the sun god, would refuse to shine. Sound familiar? The laws of succession had already been altered, there was no firstborn son to succeed Akhenaten, only a daughter and son-in-law. As the new city was abandoned, there was breakdown in law and order and the Israelite slaves saw their chance to escape. Like the other departing inhabitants they took with them any treasure they could lay their hands on. They “despoiled the Egyptians” (Exodus 12:36) and marched off with precious materials and above all the battle shrine of Tutankhamun. Where then was his battle shrine ? It had been taken away by the Israelites. That of Tutankhamun was taken by the fleeing Israelites and converted by artisans Bezalel and Oholiab, as instructed by Moses, to become the portable Mishkan or Tabernacle, that accompanied them through the wilderness and landed up at Shiloh, in Canaan. Thus it was made of the finest material, as was everything else that Tutankhamun left behind, including furniture with carrying poles and a golden chest surrounded by cherubim. Sound familiar? THUS, AT the death of Akhenaten we have a situation in Egypt where the three major conditions of the Israelite account of the Exodus came together; the building of a vast mudbrick project; a period of unrest and turmoil when slaves could escape; and the foundation of the Mishkan in the shape of a luxury battle shrine. The date of the death of Akhenaten is placed at about 1330 BCE, and Tutankhamun came to the throne the same year. Was that then the date of the Exodus? Dating is a tricky subject and it is difficult to see how the Hebrew Bible can give us exact dates, for how were they counted in antiquity? But the Bible gives us two hard dates. One is that the Children of Israel were in Egypt for exactly 430 years, from entry to Exodus (Exodus 12:40). If the Exodus was 1330 BCE, the entry would have been in 1760 CE. That of course is too early for Jacob and his 12 sons, and the rabbis themselves have rejected that period of 430 years and reduced it to 210 years in the Passover Haggada, to relate it more logically to the four generations from Jacob to Levi, to Kehot, to Amram, to Moses. But it works with the idea that the Israelites came to Egypt with the semitic Hyksos, as proposed by Josephus Flavius, the early Jewish historian, and that event is placed by scholars at around 1750 BCE. The other “fixed” biblical date is that the Solomonic Temple was built 480 years after the Exodus (I Kings 6:1). That is a nominal date as the author will have counted 12 generations and multiplied them by the biblical reckoning of 40 years per generation. But that figure is too high, as a generation, for even in biblical times it was more like 30 years. If we then say 12 generations make up 360 years, then 360 years after 1330 is 970 BCE. The Temple is dated by most scholars to around 950 BCE, so 970 BCE is not a bad fit. Evidence or not for the Exodus? Evidence there is none, but we can see that there was one period in Egyptian history when such an event could have taken place, one period when the three major conditions suggested by the biblical account came together and could have given it plausibility. And that would make Akhenaten the Pharaoh of the Oppression and young Tutankhamun the Pharaoh of the Exodus. And the date? That would be around 1330 BCE. Rosenberg’s proposal has some merits. However, I doubt that Akhenaten was the Pharaoh of the oppression and that Tutankhamun was the Pharaoh of the Exodus. The mention of the cities of Pithom and Rameses in Exodus 1:11 clearly indicates that the Exodus occurred in the 13th B.C. during the reign of Rameses II (1290-1224). This entry was posted in Archaeology, Egypt, Exodus and tagged Akhenaten, Amarna Age, Exodus, King Tut, Tutankhamun. Bookmark the permalink. 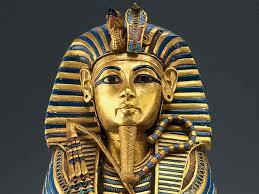 1 Response to Was King Tut the Pharaoh of the Exodus?